It seems that super straight and smooth hair is all the rage as are expensive Brazilian blow-outs to accomplish this. I can't afford the latter, so for the last two weeks, I've been using The Repair Through leave-in conditioner ($24) from Yuko, the original Japanese Hair Straightening company in the US located in Beverly Hills. Their patented revolutionary technology straightens hair without compromising the hair’s health or vibrance. 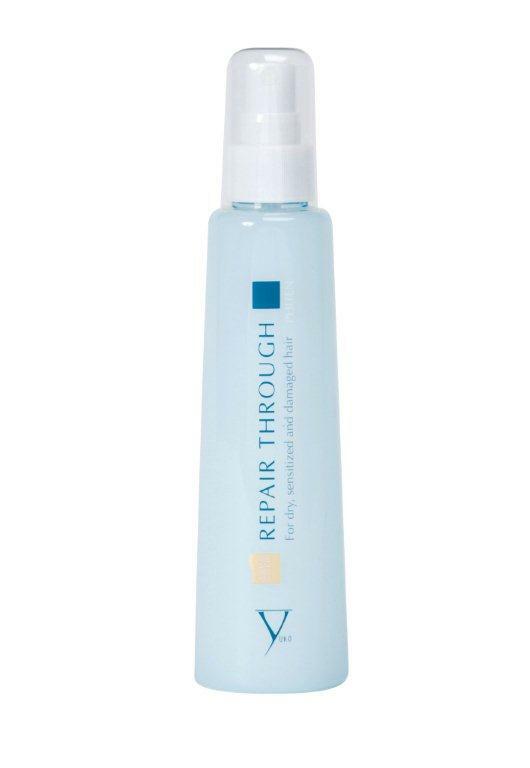 The Repair Through contains Aqua-Gold, which is real "gold" for your hair. The Aqua-Gold helps deliver nutrients into the hair faster, smoother and more evenly. The Repair Through also contains amino acids, silicone, and is alcohol-free. It prevents split ends too, which I've been getting since putting highlights in my hair. It also reduces tangles, and protects your hair from the damage that can be caused by using a blow dryer or flat iron. So, even if you have straight hair already like me, it's nutrient-rich for your hair. All you need to do is spray it on towel dried hair, before blow drying or air drying your hair. I'm a little heavy handed with the spray, but it still leaves my hair feeling soft and not oily like Bio Silk does. My hair also feels stronger and healthier after using it regularly. Apparently, celebrities such as Ariel Winter (Modern Family) and Brooke Shields are also fans of the leave-in spray too. Good news, 5 lucky winners will be able to try the Yuko Repair Through out too, as I have five bottles to giveaway here. How to enter: Just leave any ole comment here by Friday, May. 6, but please don't forget to leave your email address in the body of your comment or link back to a blogger profile or website that actually has your email address on it. U.S. mailing addresses only, sorry. While I have naturally straight hair, I'd very much like to try this product for its nutrient, protein-rich, silky-to-the-touch benefits. Thanks for sharing your review. oh i love trying out new products. this would be fun. I love products, especially hair products! I hope I win, I want to try Yuko's product. I am always on the look at for great new products to manage my hair. Yuko's sounds really good. this sounds great! my hair can use any help it can get! I'd love to try this product - thank you! I have very long hair and could use this! I'd love anything to get rid of the tangles! Thanks for the helpful review and giveaway! OOH! I'd love to win this - there's a reason my pic is of pretty trees and not myself... anyhoo, the email is emysotheremail at gmail dot com in case random.org decides to smile upon me! I would love to try this product. I have wavy ish hair and would love to try something that would straighten it and make it shine. would like to enter; my hair could use it! thanks! I'd love to give this a shot; thanks for the chance to win! Awesome giveaway. My hair is in desperate need of nutrients, please help! sounds great! i've been using cream leave in conditioners but they're pretty thick and can end up leaving my hair a little stiff. My hair desperately needs this! oo anti-split ends, something i need. Could use this for my ratty hair about now! I'm waiting to donate, so split ends are massive! we are currently rebranding our salon/spa and are using Keratin and we are looking for new intovative porducts. I would love to experience the Yuko Repair since I have very curly/wavy hair and the added humity of Florida. I hope I get to experience this product. Thank you. My hair could definitely use this ! This sounds wonderful. I'd love to try it. I like Yuko on Facebook. I follow both @yukousa and @TaraMetBlog on Twitter. I have wavy frizzy hair and would love to try a product that actually works on my unruly hair. My name is Jennifer and you contact me via snowbaby@gmx.com. I liked Yuko Hair Straightening on FaceBook. I also liked your blog on FaceBook. I am Jennifer Lynne Mohr on facebook. I am following yukousa and tarametblog on twitter. My account is @AngelicLies. Even though I don't straighten/blow-dry/curl my hair I still seem to get damage... this would be nice to try! My hair is awful. This could change my life. Thank you! I feel like a winner!